Hangouts on Air helps you live broadcast your hangout and stream it publicly on your Google+ profile, your YouTube channel, and your website. You can have 9 people participate in the hangout and the rest watch the hangout live. The hangout is automatically recorded in your YouTube account and can be edited and shared once the hangout is over. Announce the topic of the HOA to your followers or start a quick poll to see what topic they might be interested in hearing about. Create an Event for the Hangout on Air and share it with your followers. Do this at least a week or two in advance to give people time to sign up for the event. 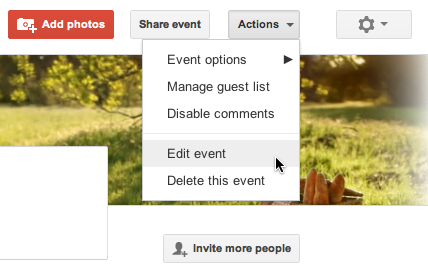 OPTIONAL: If you want the event to be public but only want the people you've invited to be able to comment/share photos, choose Make this an event on air while creating the event. This option is in the Advanced section under Event Options. From the sign ups, pick the Panel, the 9 people who will be part of the live hangout. Send a message to let them know they have been selected and ask them to RSVP for the event. Assign one of them to keep an eye on the comments from the viewers and pass on relevant questions into the hangout. Install the Hangout apps and test them out. Start the HOA (watch the video for instructions) and invite your panel in. Do a quick voice and video check and ask anyone who's not speaking to mute their mics (You could do it with the Volume Control app too but it's nicer if they do it themselves). 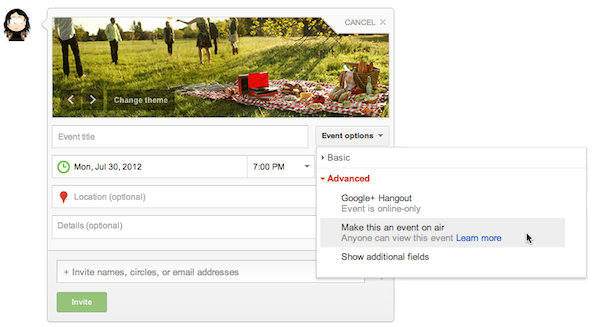 Click on the Embed link next to the Start Broadcast button on the top right corner of the Hangout and copy the link. This is the link for the live stream of your hangout that you can embed in your website and add to the event. Go to the Event you created and edit the event. Click Event Options >> Advanced >> Additional Fields. Paste the link in the text box labelled YouTube URL. Use the same link to embed the Hangout video on your website. Ask your Comments Lookout (you did pick someone for this, didn't you?) to open the standalone version of Comment Tracker, and enter the link of the Google+ post where people are watching the live broadcast. That's it, you are ready to broadcast your hangout. Click on the Start Broadcast button to go live. Make it interactive and, the most important part, have fun! Add a wrap-up comment on the post, answer any follow-up questions, and thank your viewers and panelists. If you want to edit your recording (add links, opening closing slides etc), download the video from your YouTube account (or edit it in YouTube). Upload the edited version and reshare it on your profile/+Page. If you embedded the video on your website, update the code to point to this video instead. +John Mueller "create a Google Docs presentation with a welcome-screen, and screenshare that at the start, before you start broadcasting. That way, you'll have a title-page for the video without having to download the video and process it offline." HOA tips from +Fraser Cain in this post.